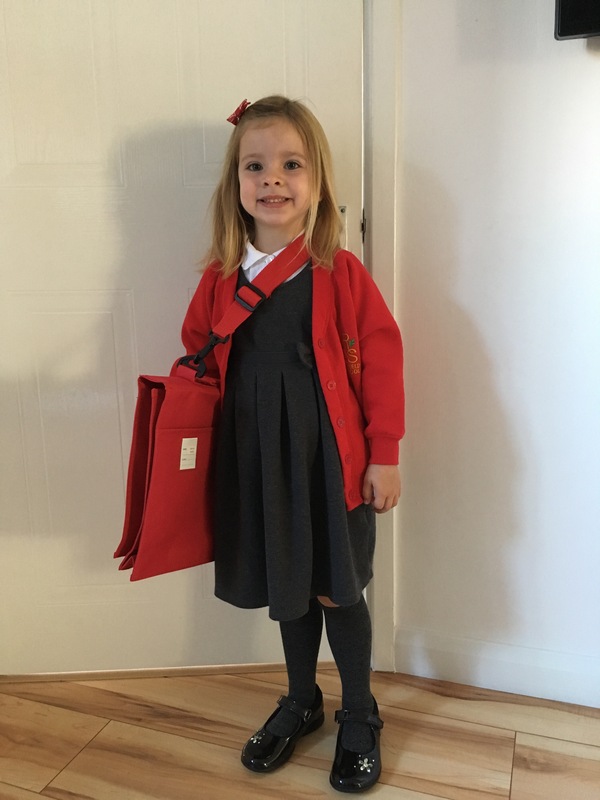 It is now two weeks since Tinker started school. I&apos;ll be honest, it was emotional – for me, not for her! She skipped into school and lined up with barely a backward glance, and has continued to do so everyday which is brilliant, and obviously a huge relief. I had been struggling with the very thought of it for weeks (months) even though I knew she was ready and super excited to go. But she is my baby girl, and I wasn&apos;t sure I was ready to let her go. Obviously, she is not my first, I have been through the same process a few times already, but it&apos;s still a huge deal. I was also worried that it wouldn&apos;t live up to her expectations, that she would be disappointed and disillusioned if it wasn&apos;t as exciting and fun as she obviously thought it was going to be. 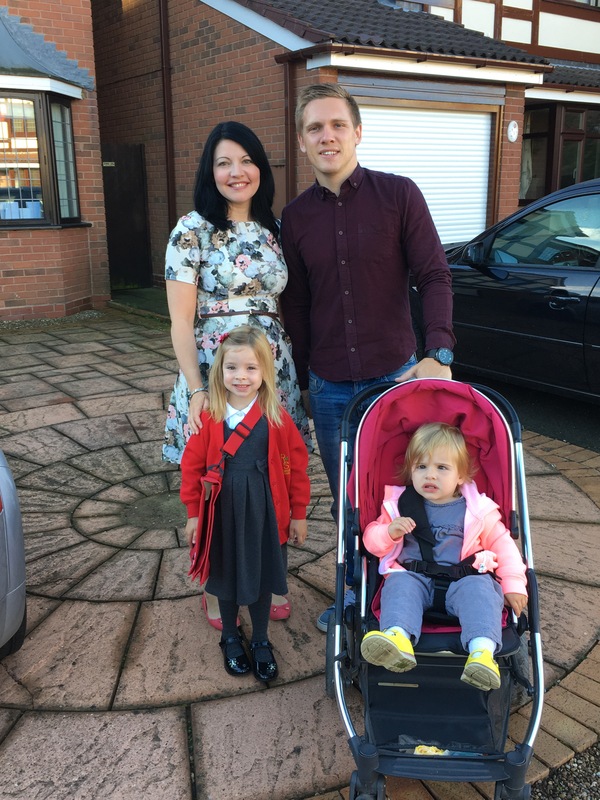 Opening the front door on the very first day, ready to start our walk to school for the very first time I had to take a huge deep breath, fight back the tears and smile for the obligatory front door photo. Arriving at school we trooped onto the playground, me clutching on to Tinker&apos;s little hand, followed by Dave pushing Totsy, big brother Nathan and Adam (Tinker&apos;s daddy who we had met at the gates). She suddenly looked so small in her uniform, even though when she had put it on that morning she had seemed so grown up. She was waving to all her friends from pre-school and seemed happy enough, but I could tell she was feeling just a bit apprehensive for the first time. Suddenly, the bell went, her teacher arrived and after hugs and kisses off she went to line up, the first in the line. And that was it. My little girl was now officially a school girl. The moment she had been looking forward to as much as I had dreaded it had finally arrived. So then, as she disappeared into her classroom, we had to actually leave. Actually leave her with virtual strangers. Thank goodness it was only for the morning! On the walk home, I managed not to turn into an emotional mess as I feared (high five to me for not lying face down on the playground wailing &apos;My baby, give me back my baby!&apos; which is what I actually wanted to do) but instead only a discreet tear or two fell, I swallowed the lump in my throat and was super grateful for the extra tight squeeze of my hand from Dave. Back at home, everyone disappeared off to work and it was just me and Totsy. I was on edge, nervously counting down the minutes until I could pick her up, wondering what she was doing and hoping she loved it. After what felt like forever (but in reality was barely long enough to have a cuppa, sing a few songs with Totsy and run the vacuum round) it was time to pick her up. This time it was Milly who came along, and we approached the playground nervously. All the way there I had kept on saying &apos;I know she&apos;ll have loved it&apos; but when finally I saw her little smiling face at the front of the line, waving before she came running over it was a huge relief. She had actually loved it. It was going to be fine. Her first two weeks have gone really fast, and thankfully without a hitch. It still seems new and I&apos;m sure every single day won&apos;t be plain sailing but so far, so good. And I know we are so very lucky, I see some of her classmates in tears clinging on to their mummies in the morning and my heart goes out to them (I&apos;m sure the kids are fine as soon as the classroom door closes, but I know how distraught and guilty the mummies must feel). Tomorrow she starts full days, and this again feels like a huge deal. She will now have to negotiate school dinners all by herself for the very first time (when I say all by herself, I mean with her year six buddy and her class&apos;s dedicated lunchtime supervisor, but still!) It is a work day for me, and so it will be her childminder who delivers and collects my precious little Tinker from her very first full day at school. Huge mummy guilt. But thank goodness, I know she will be fine. She won&apos;t even mind I&apos;m not there. Because (sob!) my beautiful, funny, feisty, frustrating, cute little baby is growing up. Tags: First day at school, Starting school. Bookmark the permalink. Previous post ← My very first blog post….hello!